Under water signal devices have always been a problem until now. The laser grabs your attention from any direction and directs you back to its source. This is the only scuba signal device that will attract the attention of another diver silently and from any direction. All you need to do is point it in front of the other diver and he will see the light beam passing before him through the water. And the good news is, it works great in turbid water as well. Because of the speed with which sound travels through the water an audible device does not tell your dive buddy which direction to look. A hand held flasher doesn't do any good unless your dive buddy is looking in your direction. The green laser will place a bright green dot on whatever your dive buddy happens to be(simulated image of laser) looking at. Or if he is in open water he will see the beam passing in front of him through the water. Need to signal the boat or even a plane. This green laser is so powerful it will put a bright green spot on an object a quarter to a half mile away. 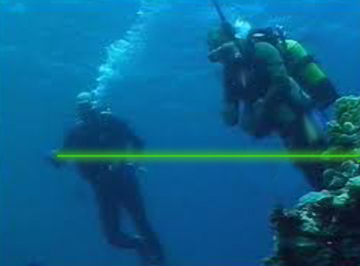 We have received a report on a personal experience by a diver who discovered how important a green laser could be if you need to be found after losing connection with your dive boat.